Buy your Carousel on Broadway tickets before you go to New York. Purchasing theatre tickets online is safe and easy and, most importantly saves you time and money. 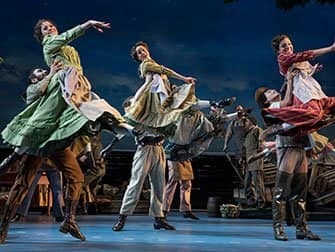 This revival of famous 1945 Rodgers & Hammerstein musical is performed in the Imperial Theatre and has already been named as the ‘best musical of the season’. Carousel tells the story of a fairground worker with issues, and the young woman who gives up everything for him. Carousel is a tragic love story. Village girl, Julie gets in to a relationship with traveling fairground worker, Billy. They marry and Billy does everything he can to make Julie happy. However, he inadvertently makes the wrong decisions, consequently landing them both in trouble. Even the life of their daughter is influenced by the stupid things her father has done. However, Billy gets an unexpected opportunity to correct his past mistakes. The story and music (one of the famous songs in this musical is ‘You’ll never walk alone’) will carry you away. In addition to the impressive dance routines, choreographed by New York City Ballet’s Justin Peck. 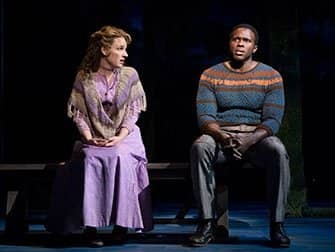 How to buy Carousel on Broadway Tickets? It’s easy to buy tickets. Above, select the date that you want to go. You’ll get an overview of all tickets available. Choose how many tickets you would like, add them to your cart and pay right away. After paying, you’ll receive a confirmation and your voucher right away by email. You’ll exchange the voucher for tickets at the theatre on the day of the show, at least one hour before it starts. Recommended for age 9+. Children under 4 are not permitted in the theatre.